We are situated in the small, but thriving town of Maghera, County Derry, Northern Ireland. The town is extremely centralised, as it’s located in the Mid-Ulster area. Maghera is approximately thirty-five minutes from Derry City and forty-five minutes from Belfast City. The town is also relatively close to some of Northern Ireland’s biggest towns such as Coleraine and Ballymena. 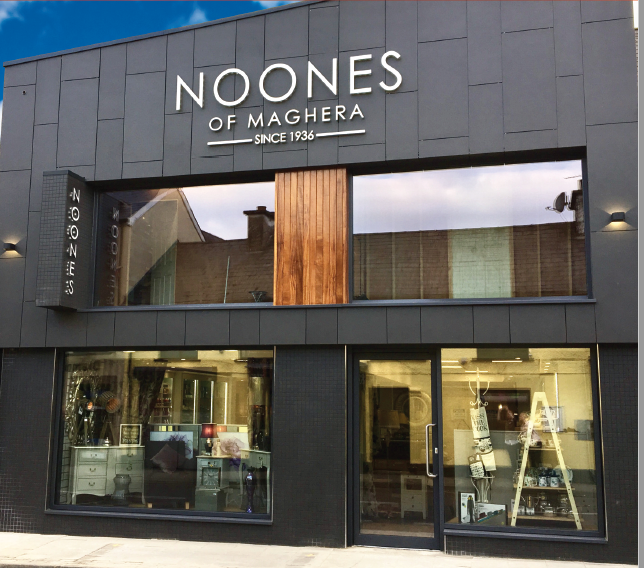 Noones of Maghera has been providing an essential service to the community and surrounding areas since 1936. We are one of the few pre-war businesses which are still in operation in Maghera. This underlines the progression, and continued trust our customers place in us. First started in the 1930s by William and Betty Noone, the company specialised in groceries. As time progressed Willy Noone branched into Hardware and building supplies, and by the mid 1960's Noones was fully established. Maghera was growing more and more each year and Noones was developing in the same way. It was at this time that Willy and Betty Noone decided to retire and sell their business to Frank and Maisie McKenna. Noones had employed Frank since 1946. The name of the shop was not changed due its established nature. Frank enjoyed continued success and even branched into giftware. This decision proved to be hugely successful. Thirty years later Frank retired in November 1996 on the sixtieth anniversary of the shop. In turn Pat and Kathleen McKaigue of P &K McKaigue building contractors took over the business, at this stage Noones went through extensive refurbishment and renovation. With the gift-ware being expanded along with the separate department of the hardware and building supplies, Noones holds more stock than it ever has had before. Today Noones is continuing to expand its customer base not only to surrounding areas but also beyond. With many different sectors of retail Noones provides an excellent service and taking this one step further with offering our gift-ware online. For over ten years our Wedding Gift List service has been in operation and with the growing popularity we have strived to perfect our service. 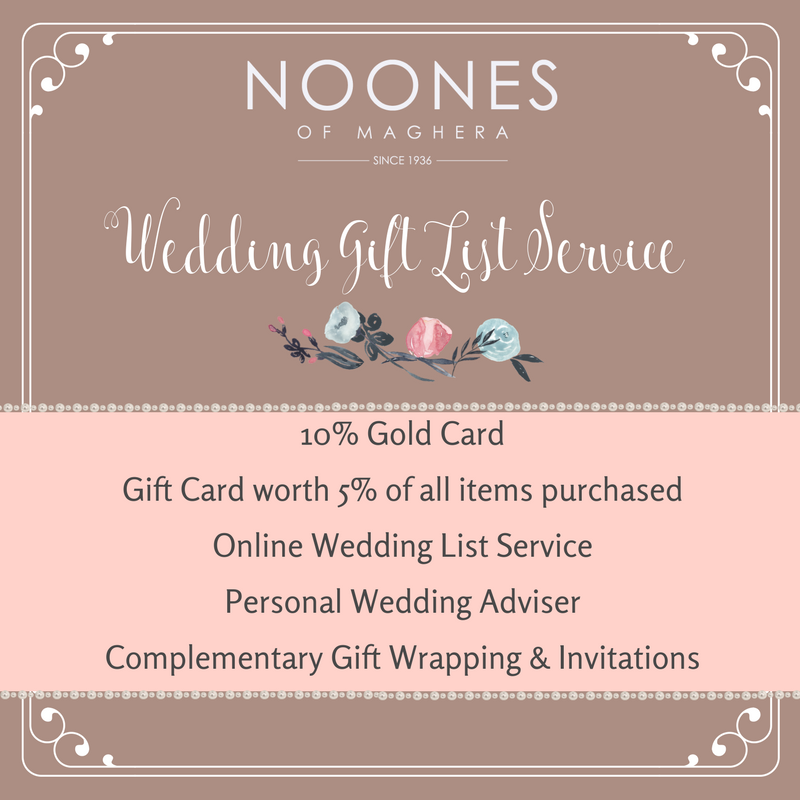 Noones provides wedding gift lists with everything you require when getting married and/or setting up your dream home. Choose from an extensive range of high quality gifts including leading brands such as Le Creuset, Stellar, Denby, Belleek, Newbridge Silverware and Tipperary Crystal. For our customers convenience, guests can browse and purchase from wedding lists online. This will enable relatives or friends to purchase a gift of the couple’s choice, ensuring an easy and hassle-free shopping experience. Noones will also provide a free gift wrapping service and free local delivery to the wedding couple.